Break Down Unsightly Debris! Microbe-Lift Oxy Pond Cleaner will safely yet immediately breakdown accumulated debris from rocks, streams and on waterfalls. Microbe-Lift OPC, Oxy Pond Cleaner will safely spot-treat all areas of light-to-heavy accumulations of debris on rocks, waterfalls, streams, planters, etc. 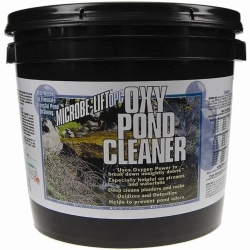 Microbe-Lift Oxy Pond Cleaner is 100% safe when used as directed. Directions: Microbe-Lift OPC, Oxy Pond Cleaner is not temperature sensitive but works best in warmer weather. To achieve the best results, manually clean out as much accumulated debris from the pond as possible and shut down waterfalls before cleaning. Do not dilute. To treat areas with debris build up, sprinkle over areas needing treatment. Make direct contact but avoid live plants where possible. To maintain a continued proper ecosystem in your pond, always add Microbe-Lift PL, or any bacterial/enzymatic treatment, 48 hours after using Microbe-Lift Oxy Pond Cleaner. Before Use: Use Microbe-Lift Ammonia Test Strips to test for the presence of ammonia in your pond water. If ammonia levels are above 0.8mg/L, DO NOT apply Microbe-Lift OPC, Oxy Pond Cleaner until the ammonia level is brought down below 0.8mg/L. If ammonia levels exceed 1.0mg/L, add Microbe-Lift Ammonia Remover. After Use: Ammonia levels should be monitored for two days following applications of ANY/ALL oxygen release compounds as they can kill beneficial bacteria in a pond/lake resulting in an ammonia or nitrite spike. Use Microbe-Lift Ammonia Test Strips to test for the presence of ammonia. If your ammonia levels exceed 1.0mg/L., add Microbe-Lift Ammonia Remover to reduce the ammonia level to 0.8mg/L or below. 80 - 200 .75 oz. 1 oz. 1.5 oz. 201 - 500 1.5 oz. 2 oz. 3 oz. 501 - 1,000 4 oz. 6 oz. 8 oz. 1,001 - 1,500 6 oz. 8 oz. 12 oz. 1,501 - 2,500 8 oz. 12 oz. 16 oz.